Here are your Day 4 EV totals and the full 2010 EV totals. Mail ballots continue to be strong, up a bit from Day Four in 2010, but in person totals continue to lag. Overall, 2014 now trails 2010 at this point in the process by about 5,000 votes, with about 142,000 having been cast so far this year. As we discussed last time, the mix of voters is more important than the totals. So far, indications for Harris County say “better than 2010 for Dems, but not where we want to be yet”. If the pattern for this year is like it was in 2012, Saturday is the key day. It would be nice to do better than that before then. Here are the statewide three day totals and the comparable figures from 2010. As we have seen on other days, overall turnout is up thanks in large part to the strong mail ballot returns. The TDP sent out an email earlier today taking a victory lap for that. I hope they have reason to brag, but I don’t have any data on it. Finally, a couple of turnout-related news stories. From the Statesman, a reminder that we don’t yet know who it is that is turning out, and from the Monitor a story about strong EV turnout in Hidalgo County. 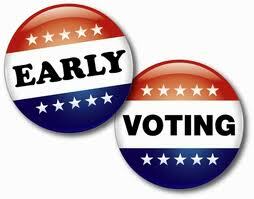 We can’t say yet that more early voting will necessarily mean higher final turnout, but that’s still encouraging to see. UPDATE: Almost forgot: Check out Drive for Democracy and volunteer to help drive someone to the polls. And for my Heights friends, why not have breakfast with Leticia Van de Putte on Saturday morning before heading to the polls?